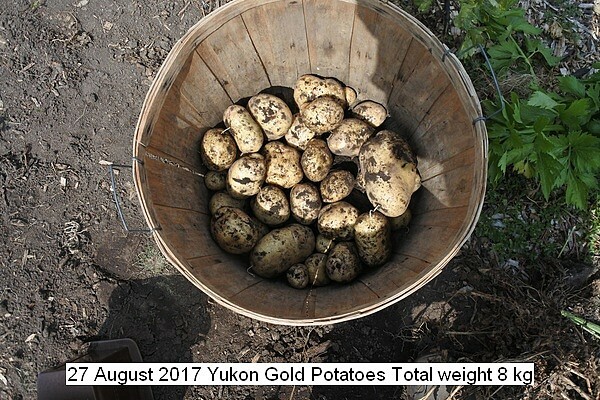 The last of the Yukon Gold Potatoes were harvested. There were eight plants with the seed potato position marked by a stake. The yield was on average 1 kg per plant total being 8 kg. This is below expectations which was slightly over 2 kg in past years. The quality is excellent. The growing weather was below average, cool and wet. This entry was posted in Uncategorized and tagged 27 August 2017 Yukon Gold Potatoes, Yukon Gold Potatoes, Yukon Gold Potatoes Harvest. Bookmark the permalink.